In the c oaching circles, the old saying is you never want to be the guy who replaces a legend. You want to be the next guy, replacing the guy who replaced the legend. Well, you can throw out that old saying when it comes to Gary Fifield. Coach Fifield came to the University of Southern Maine in 1987 and took over the Huskies program from the legendary coach Richard ‘Doc’ Costello (MBHOF Class of ’16). 27 years and 660 wins later, Gary Fifield became one of the most successful NCAA Division III coaches in the nation. The next generation Maine basketball coaching legend. Fifield was born in Hanover, New Hampshire and grew up in Vermont. Perhaps his coaching passion began when he coached Little League in Thetford, Vermont. He was a senior at Thetford Academy at the time. Fifield’s coaching passion took him to the high school and college ranks in Vermont and then in 1987, the call to replace Coach Costello at USM. His 1987-88 Huskies team finished with a 27-3 record, winning the Little East Conference and going all the way to the NCAA Division III Final Four. Fifield’s team kept winning and winning. 22 consecutive seasons of winning at least 20 games. 21 times USM won or shared the LEC regular season crown. 20 times his Huskies won the LEC tournament title, including 11 straight years from 1997-2007. 14 times the LEC named Fifield their Coach of the Year. And how about this stat – 23 out of his 27 years coaching USM, Fifield took his team to the NCAA tournament. Five times (1988, 1998, 2000, 2005 and 2006) USM made it all the way to the D-III Final Four. Three of those five times the Huskies played in the national championship game. After leading the Huskies to a remarkable 31-3 record in 2004-2005, Fifield was named WBCA D-III National Coach of the Year. Gary led his Huskies to 16 ‘Sweet 16’ appearances and 10 ‘Elite 8s”. His USM record of 660-137 is an 83% winning percentage, 5th best among NCAA women’s basketball coaches. When the Little East Conference put together its 25th Anniversary Team, Gary Fifield was selected as its head coach. He was part of the inaugural LEC Hall of Fame Class in 2013. 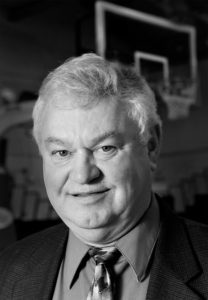 Fifield was inducted into the New England Basketball Hall of Fame in 2003, the Maine Sports Hall of Fame in 2013 and then USM Huskie Hall of Fame in 2015. The Maine Association of Basketball Coaches honored Gary in 2007 with the ‘Bob Brown Contributor Award’, given for Outstanding Service and Contribution to the game of basketball. In June of 2015, Fifield retired as USM coach and Associate Director of Athletics. In December of ’15 USM officially named the court at Hill Gymnasium ‘Gary Fifield Court’. Fifield and his wife, Mary, have one son, Ashley, and reside in Gorham.